Old wine in a taller bottle. Fluid UI; Clean design; Impressive camera; Great sound quality; Long battery life; Excellent for gaming; Rich App Store. Expensive; A few apps run letterboxed; Lacklustre maps; Limited codec support; Lacks FM Radio; Can't share files over Bluetooth; No mass storage mode. This is our full review of the iPhone 5. Click here for a quick summary. When the iPhone 4S came out, no-one could tell it apart from the iPhone 4. Little wonder, then, that Apple fans were expecting a design overhaul in the next iteration. True, there's not too much that's new here, but how radically different was the GALAXY SIII from its predecessor? The guys at Cupertino did deliver on some fronts: For the first time, the iPhone's screen size has been changed — from 3.5" to 4". The iPhone 5 is more powerful, but keeps its slimness intact. Yes, quite a few fanboys had wireless charging and a detachable camera lens on their wish list, but that was too much to ask for in a single upgrade. In any case, two months after launch, what matters is whether the phone of the year can hold up against the legions of Android and Windows Phone 8 devices. The moment you hold the thing, you get an idea of why it sells like it does. In a market overcrowded by Android phones, the elegant iPhone 5 stands out even just on the basis of design. It's taller than earlier iPhones, but its width remains the same — which gives it the trademark elongated look. A week with the phone, though, and you'll get used to it. The anodised aluminium back — as opposed to glass — makes the iPhone 5 more durable. But in terms of aesthetics, I'd still prefer the glass finish over the new two-toned design. In case you're wondering, this is the same material you see on the Nokia N8. The 3.5 mm audio jack is now at the bottom. This I find quite odd, and it does take time to get used to. What puzzles me most is the amount of space wasted on the bezel — this isn't something you'd expect from a phone that proudly says it's "Designed In California". Still, overall, the iPhone 5 is beautiful and sleek. It easily makes any high-end Android handset look like a drab piece of plastic. The new Lightning connector is a mixed bag. It's significantly smaller and more user-friendly than the archaic (and ugly) 30-pin connector. Unlike Micro USB, Apple's new, proprietary port is symmetric, which means there's no wrong way of plugging the cable in. On the downside, any accessories you might have bought for earlier iPhones will now be obsolete. As Android manufacturers continue to flood the market with absurdly large phones, it's good to see Apple Think Different. Much thought has gone into deciding the display size, which ensures that single-handed use is comfortable. The screen is impressively sharp — and bright. Since it's an IPS panel, the viewing angles are wide. It produces deeper blacks than the 4S does, but don't expect the quality of the AMOLED panels on Samsung's GALAXY S III or Note II. 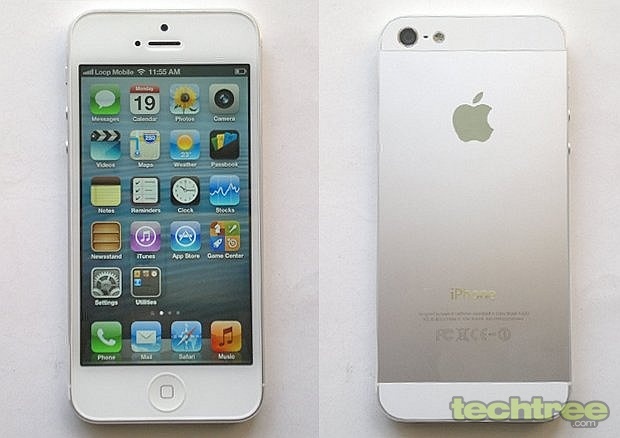 The iPhone 5 is powered by the A6 chipset that consists of a dual-core 1.2 GHz CPU and PowerVR SGX 543MP3 GPU. Other important specs include an 8 mp camera and 1 GB of RAM; the detailed list is at the end of this review. 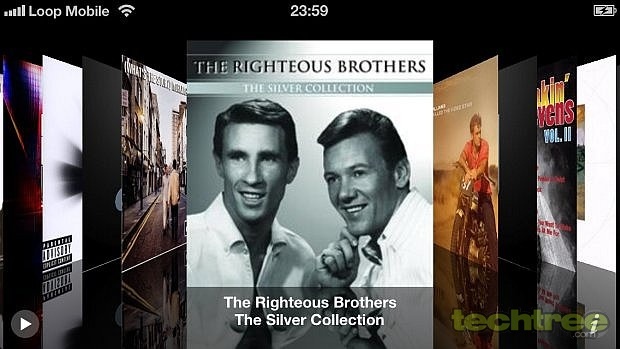 The interface in iOS 6 hasn't changed much from that in preceding versions, except for the fifth row of icons. As always, the experience revolves around the Home button and the touchscreen. The lockscreen features a quick camera shortcut, which isn't new but useful nonetheless. You can choose the wallpaper of your choice and group apps inside a folder. 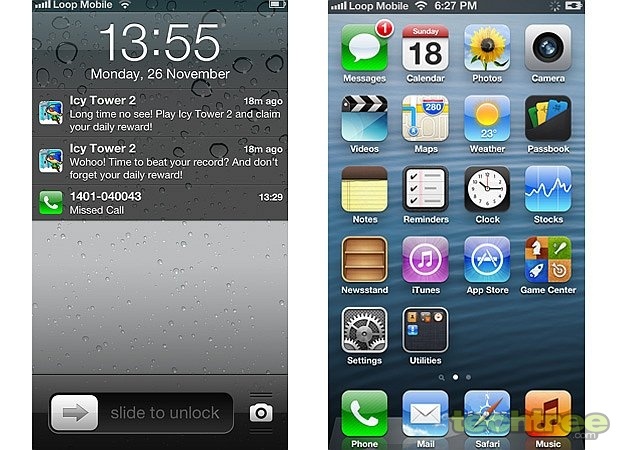 The Notification Center, introduced with the iPhone 4S, figures on the iPhone 5 as well. Yes, I'm talking about that blatant copy of the Notification Bar in Android. It now offers a few more features, such as Tap to Tweet and Tap to Post (Facebook). Another feature worth mentioning is Do Not Disturb. It allows you to turn off all the alerts within a certain time interval; you can even customise it to receive calls only from your favourite contacts. As you'd expect from Apple, the touch response is excellent. Over a week of my using it, not once did it miss an input. Moreover, I saw no lag or framing in the transition effects. 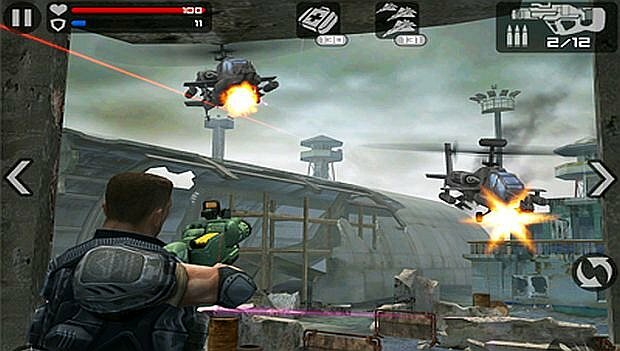 The A6 chip is powerful for sure: I didn't notice any slowdown in complex 3D games — including Frontline Commando and Real Racing 2. I know I'm stating the obvious here, but the App Store is the finest software repository on any mobile platform. Till now, every iPhone was fully compatible with previous-gen apps. This time, the screen size is different, so many popular apps including Angry Birds and Fruit Ninja run letterboxed. True, most developers will update their apps for the new iPhone — but for now, the black bands around these apps are definitely annoying. In the web department, the iPhone's Safari browser is blazing fast. Be it script-heavy pages or multiple tabs, it doesn't show any sign of slowdown. The interface hasn't changed much, though, compared to the previous iPhone; the only thing worth mentioning is the addition of a full-screen view in landscape mode. No Flash compatibility might mean quite a few disappointed users, but I'm not bothered as long as the browser meets HTML5 standards. Google has been keeping many of its map features exclusive to its Android OS, so Apple built its own mapping solution based on TomTom's data. The new software was criticized heavily, and worldwide, for its lack of information (sometimes misleading). Can you forget that screenshot of a broken bridge and an airfield located inside a farm? There are no such issues in Indian maps, though. Not that they've fixed the problems; Apple simply does not offer 3D Flyover view and turn-by-turn navigation in India. It's pretty much on the lines of Google Maps, but far less detailed. Not to worry, though — there are plenty of free maps and navigation apps, including Nokia's HERE maps. Siri is neither new nor useful, but fun nonetheless. It might have learned a few more languages over a year, but it still doesn't work well with my "Indian accent." By way of comparison, Microsoft's TellMe worked better for me, even when I spoke Indian names. On the plus side, Apple's voice assistant can now open third-party apps for you. Asking Siri to post updates on my Facebook wall was fun! For more on Siri, read our iPhone 4S review. The iPhone stills flaunts its iconic Cover Flow, and I'm really not complaining. As you'd expect from a premium device , the sound quality is great, and provides sufficient depth. Apple chose not to send us the earphones along with the review unit, so I'll have to skip that part. The equaliser settings are located in the device Settings, not in the music player — which is a mild annoyance. Thanks to the 4", 16:9 screen, watching movies on the iPhone 5 is a real treat compared to its predecessors. MP4 videos up to 1080p worked without an issue. DivX and XviD clips are still a no-go, but get a decent third-party app and you're good to go. What I dislike most about the iPhone 5 is its iTunes dependence. It's high time Apple added USB mass storage functionality to the iPhone. Even Microsoft has incorporated it in its Windows Phone 8 platform. In the imaging department, you get an 8 mp camera with LED flash. The lens assembly is slightly smaller than what we've seen on the iPhone 4S. There's no difference in the performance of the two though. The snaps I took show good detailing and natural colours. I'd have liked to see the noise levels lower than they are, but that's a necessary compromise. The [Volume +] button works for taking snaps. The star of the show here is the Panorama mode. This feature is quite common, but Apple's implementation is impressive. The process is so simple that you're unlikely to spoil a Panorama unless your hands are shaky. Click on the image to see the uncompressed version. You also get to record 1080p video at 30 fps (in MOV format). But you can't record sound in stereo, even though there's an extra microphone near the lens. Well, you can click photos while recording a video, but the detail in these pictures is capped at a disappointing 2 mp. Overall, the iPhone 5 offers a great camera, but if you own an iPhone 4S, you're not missing anything. Taking a cue from the Windows Phone platform, Apple has added the social element to its phonebook: You can now have all your FB friends in your contacts list. The handset is smart enough to merge duplicate contacts. While there's no official word on this from Apple, the iPhone 5 uses a 1440 mAh Li-Po battery. In our 720p video loop test with brightness set to 60%, it lasted 10 hours and 30 minutes. This is impressive: For comparison, our Samsung GALAXY S III managed only 5 hours and 30 minutes in the same test. The iPhone 5 is elegantly designed, and offers an extremely smooth UI. Apple has managed to increase the screen size without hurting usability. The camera and multimedia performance is nothing short of impressive. If you're using an iPhone 4 (or older), or if you're thinking of switching from a high-end Android device, and you have no budget constraints — go for the iPhone 5 by all means. But if you own a 4S, give the number 5 a miss. Apple claims that their latest phone is twice as fast as its predecessor. What I can see is that the performance difference is almost negligible. And since iOS 6 is available for the 4S as well, you aren't missing out on any of the important features save for a bigger screen. 4" Retina display with 1136x640 pixels at 326ppi, 16:9 aspect ratio, pixel density of 326 ppi, fingerprint-resistant oleophobic coating. Camera Features: 1080p video recording, Panorama, Face detection, Video stabilization, Geo-tagging. A6 chipset, dual-core 1.2 GHz CPU and PowerVR SGX 543MP3 GPU. Dual-band Wi-Fi with AirPlay support, Bluetooth 4.0, Assisted GPS with GLONASS. Supported Audio: AAC, MP3, AAX, AAX+, AIFF, WAV. Supported Video: H.264, MP4, MOV. 16 GB / 32 GB / 64 GB internal storage. Three-axis gyro, Accelerometer, Proximity sensor, Ambient light sensor, Digital compass. Lithium-ion battery with 8 hours of talk time and 225 hours of standby time on 3G, 10 hours of video playback, 40 hours of music playback. 4.8" (l) x 2.3" (w) x 0.3" (7.6 mm) (d); 112 grams. iOS 6 enhanced for bigger screen. LTE support, uses nano-SIM card.